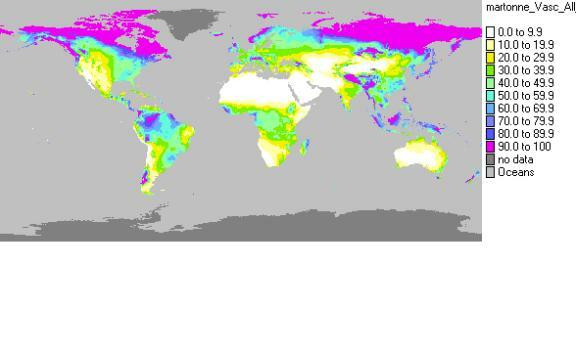 The Koeppen climatologies and the climatic net primary production maps of FAO are based on different periods and precipitation datasets. Here we provide the datasets in different formats. Furthermore some derived information like temperature of the coldest and warmest months, Martonnes aridity index and Gorczynskis continentality index are provided. The original data are brought to a common grid based on USGS gtopo30 and provided as tables in csv format (.5° resolution). For the users convenience the derived data are also provided as georeferenced data in IDA/Windisp format (5’ resolution, resampled). The table provides the links to the datasets used to derive the Koeppen climatologies and npp maps. Each of the files consists of 13 columns. The first column contains the gridpoint number, the remaining 12 columns contain the mean annual cycle of the variable at that grid point. In the case of temperature, it is the mean monthly temperature in °C or the standard deviation of temperature over the respective period. Precipitation is provided in mm per month. The meta data file consists of 4 columns with gridpoint number, longitude (in .01°), latitude (in .01°) and land fraction (in %). All data are provided as comma separated value (csv) in .5°x.5° resolution. The temporal standard deviation of the variable at the grid cell within the period is provided too. This allows a wide range of investigations. For example, it can be used to compare the average with the variability by estimating the coefficient of variability (standard deviation / average) in the case of precipitation. Furthermore it can be used to estimate uncertainty intervals for the average of each grid cell. The meta-data file with grid point coordinates is here. For the annual mean temperature und the annual precipitation sum we also provide resampled georeferenced data in 5’x5’ resolution as Windisp/IDA images. Download colour tables for IDA images of temperature, precipitation, number of months with temperature exceeding 10°C, and annual temperature amplitudes here. From the variety of existing indices to quantify aridity and continentality we only provide the aridity index of De Martonne (1926) and the continentality index of Gorczynski (1920). Note that the higher this coefficient is, the higher is the precipitation compared to evaporation and thus the less arid is the climate. This means that by definition a high aridity index means a humid climate while a low aridity index means an arid climate. 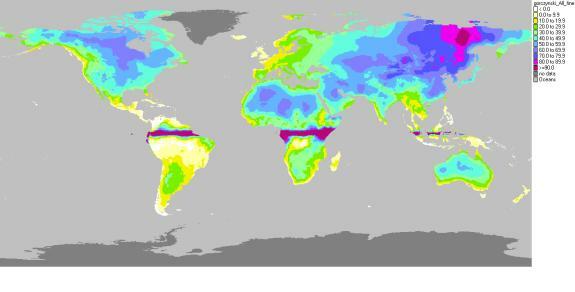 The following map shows the aridity index for the 50 year period from 1951 to 2000 based on temperature data of the CRU and precipitation data from GPCC VASClimO. It can be downloaded as a bitmap here. This original equation comes with some drawbacks. Since the sine approaches zero as the latitude approaches the equator, the values close to the equator tend to infinity. At the equator the definition breaks down. We therefore suggest not using the index values within a latitude range of plus/minus 10 degrees. In order to apply the definition also to the southern hemisphere we use the absolute of the latitude instead of the latitude itself. The following map shows the continentality index for the 50 year period from 1951 to 2000 based on temperature data of the CRU. It can be downloaded as a bitmap here. Download colour tables for IDA images of De Martonne aridity index and of Gorczynski continentality index here. Download this file as pdf. De Martonne, E. (1941) : Nouvelle carte mondiale de l’indice s’aridité. Météorol. 1941, 3-26. Gorczynski, W. (1920) : Sur le calcul du degré de continentalisme et son application dans la climatologie. Geogr. Annaler 2, 324-331.